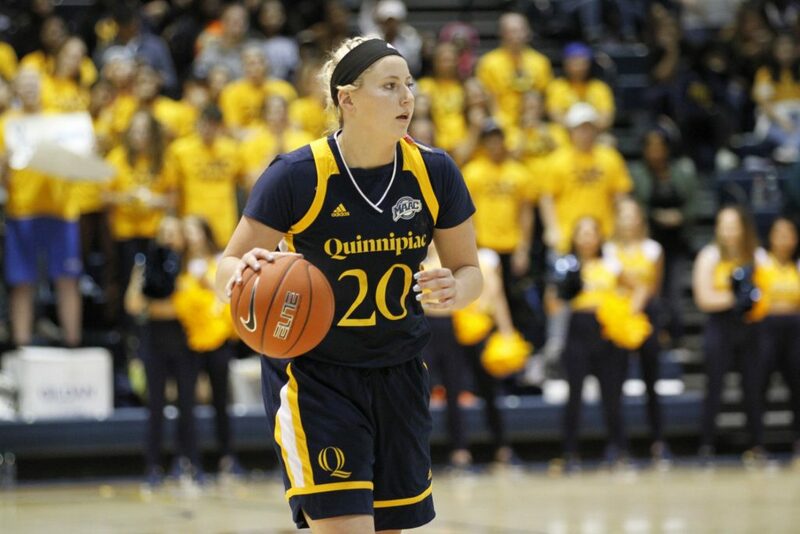 It was “Kids Day” at the People’s United Center, and it seemed the Quinnipiac women’s basketball team (12-6, 7-0 MAAC) had some fun – like playing on a playground – as the team defeated the Siena Saints (8-10, 4-3 MAAC) by a score of 68-31 on Friday. The 31 points allowed was the lowest amount allowed by the Bobcats all season. They only allowed the Saints to hit 27.3% of their shots, while forcing 12 steals and three blocks. The two points the Saints scored in the first quarter were the second least amount of points a team has scored on the Bobcats in a quarter since four 10-minute quarters were implemented in 2015-2016. “It’s been pivotal [to be great on defense],” Fabbri said. “Regardless of Texas or anybody in the MAAC, how stingy we have been…There are going to be those nights of those stretches and those shooting woes and how much we have to lean on our defense, not only to get those turnovers but also to get us going again”. The kids day did really impact the game for both sides. Neither team usually plays in front of a large crowd. However, all seats were filled during the game. The kids screaming made it hard for both sides at times to hear calls. However, head coach Fabbri thanked the kids, teachers and faculty members for the energy that they brought to the team with a speech at the end of the game. “When we play Niagara, it’s always their kids game. They try to distract us,” senior guard Brittany Martin said. “We are used to the noise during the kids game. We go into business as usual”. “We really emphasized talking during practice, because once we get in game we are not going to be able to hear coaches,” junior forward Paige Warfel said. “We have to keep repeating the calls and make sure everyone is on the same page”. However, even with the energy to start the game, the Bobcats struggled to find the rim in the beginning. The team shot 23.1% in the first quarter with five turnovers and only eight points. However, a Paige Warfel three-pointer was the real spark they needed to get points on the board, and they kept rolling from there. “For me, it was really cool hitting that three, since I do not get them that often,” Warfel said. “I know last year I did not shoot them at all. It was really cool to just get that momentum going”. A standout player from the game was the one who scored the first coincidentally. Warfel had a double-double, the second for the team this year and her first of her career. She ended the game with 14 points and 10 rebounds, as well as two assists and two steals. “It’s super exciting [to get my first double-double],” Warfel said. “I feel I’ve always been right there and finally got that exra rebound. It’s really exciting”. A scary incident did occur to one of the leaders of the Bobcats Redshirt senior forward Jen Fay went up for a layup and made it – however, she came down hard on her left knee. She came off the court and had her knee looked at by trainers. She would not return to the game, but coaches and players feel positive about her recovery. Next upcoming for the Bobcats is another MAAC opponent, the Iona Gaels, in New Rochelle, New York on Sunday, Jan. 27 at 1 p.m.